Rabbie’s had his say, as has his ill-fated cousin, we’ve seen a melancholy lament about a nineteenth century fishing disaster, a local resident has described the antiquities of a village house in rhyme and even the local press heralded the saving of Findon, Downies and Portlethen in a poem. 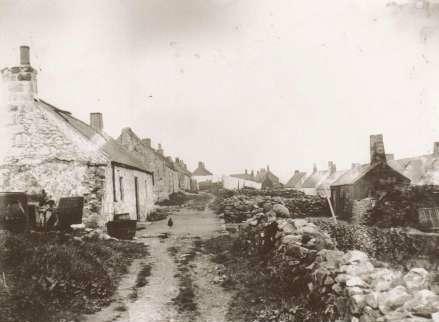 Now it’s my turn to put a few of my own words into verse to give my own personal twist on how things have developed in Portlethen, from the distant past up to the present day. If you can’t be bothered fighting your way through the complete website, yet are still interested in the history of our fishing villages through the ages, then look no further – it’s all here in a summarised and shortened version. Enjoy. For better or worse, Portlethen in verse. Aboot the Monarch’s lust for her, in a work o’ poetry. Of sna’ an’ wind, a place to stay, an’ a ghost tae gie a fricht. An’ now it turns tae me, Portlethen’s story here tae show. Pittin’ these words tae paper, I dinna ken fit tae expect. O’ a’ the characters and stories, fit eens div I select? Of history and anecdotes, we’ll recapture a’ their glory. I’ll try an’ tell ye some o’ them and gie a guid review. The ring foon’ at Cairnwell was aince a guid example. An’ lang afore the Vikings wi’ their murder an’ their plunder. Fae een toon tae anither, nae Moss wid haud it back. The road itsell ye micht nae find, its maistly noo thin air! His estate was that o’ Finnan, an’ some others he combined. But Bruce’s rise in Scotland, sent him hame tae think again. It ended up wi’ Menzies ambushed by Forbes’s men. When Forbes raised his dagger in this merry month o’ May. But still it sits in perfect place, a view ye canna deny. Nae protection fae the elements o’ the great ootdoors. A plan wis done, a price wis said, but it a’ went doon the pan. They disappeared lang ago, afore oor Granda’s were laddies. An’ captured fae the rugged rocks wi’ a shinin’ reel and rod. An’ for a’ their shipwrecks, an’ men lost and drowned. Is it ony wonder, some boats ne’er reached their dock? A’ washed ashore near Finnan, smashed tae mony a smithereen. The fog will sneak ahent ye, and surroond ye like a wraith. That show at times its possible tae beat they south east gales. He saved three men fae droonin’ wi’ a rope an’ a cunning plan. The very words said aloud, oor fishermen they will scare. Or the result is sure to be; that boat will end a wreck. Young men set aff tae Torry, seekin’ their ain new dawn. The talk was o’ “the auld days”, an’ forever they’d moan an’ grumble. So the planners got thi’gether, wi’ a new plan in their heid. We’ll build a brand new village, an’ bid these ruins adieu. Tae get some rinnin’ watter, the ‘lectric and some licht. An’ they didna hae tae move to a hoose at Burnside. Saved fae rack an’ ruin, noo bonnie places tae dwell. Replaced wi’ modern artefacks like a smoke-free, gas barbie. Hae a look aboot ye but fae the cliff staun’ back. An’ sometimes jist occasionally a school o’ wild dolphins. But fit aboot the new toon, the een beside the station? The een the planners wanted, their wonderful new creation. But a marvel o’ creation? O’ that there is some doot. So fit’s the matter and fit’s gaun wrang, is it plain tae see? Is it a’ the planners that noo beg tae disagree? The new toon o’ Portlethen appears tae lack a heart. Hae hired a team o’ specialists to rid us o’ a’ oor weary. But when it comes tae mak a pick, will they listen tae local voices? So fit wid Dodie Batty say, or even Rabbie Burns? O’ a’ oor local history an’ a’ its twists an’ turns. An’ say that “evr’y minit wis mair than jist worthwhile”.